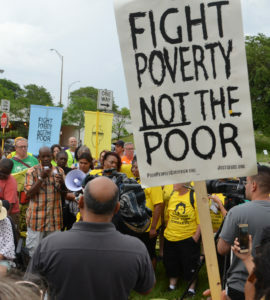 Monday Scott, an EVS worker at Presence Resurrection Hospital, speaks at the Poor People’s Campaign, June 18th, 2018. 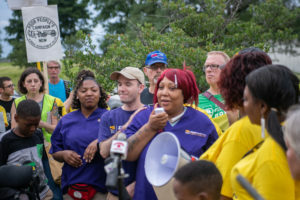 (June 18th, 2018, Chicago) — Hospital workers joined the Poor People’s Campaign rally to call attention to the crises of homelessness and held a press conference near the overpass at Lake Share Drive and Wilson after families and indivuals were recently removed as a new bike line was installed. 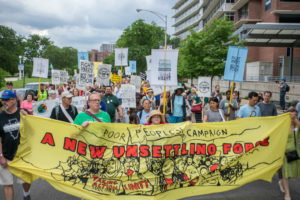 The Poor People’s Campaign, a national movement to call for a moral revival, focused on a range of issues and attacks on working and low-income families, including poverty, lack of access to healthcare, and income inequality. 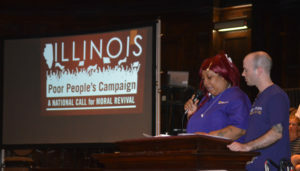 Our hospital worker, Monday Scott, an enviromental services tech at Presence Resurrection Hospital, gave a powerful speech and testimonial about her struggles earning a poverty wage while raising two children and her two granddaughters after her daugher was killed by gun violence last year. (Watch video of her speech, or read her written remarks below). Good evening. My name is Monday Scott. I’m pleased to speak on behalf of the Poor People’s Campaign today. I also wish to honor my fellow hospital and healthcare workers across the Chicago region who are not recognized nor respected by the hospital industry. We, as hospital workers, are worth more! I’ve worked as an environmental services tech for 4 years. I earn $13 an hour. And while I pleased that the Chicago minimum wage is going up to $12 an hour on July 1st I’m here to tell you that $12 AN HOUR ISN’T ENOUGH! Working people of all stripes deserve a living wage – which is why we need a starting wage of $15 an hour RIGHT NOW! As a hospital worker, we care for and VALUE everyone and anyone who comes into our hospital. It’s who we are and what we do. I don’t have the option to turn away or turn a blind eye towards those we need help. And yet….. we as hospital workers aren’t valued ourselves. In our current society, we don’t VALUE that hard work of those who earn low-wages whether we work in fast-food, home care, nursing homes, child care centers, airports, as or as janitors. As we sit here today at this protest, we don’t value those whom are homeless, do we? On the national level, President Trump – who is truly a vulgar man – doesn’t value families. Trump is willing to separate young children from their own mothers and fathers. But we are gathered today to clear define what OUR VALUES are. This gathering today is a demonstration of both our MORAL FIBER AND MORAL FORCE! Yes, a “new and unsettling force” is gathering my friends…. It’s written on our banners today, but it’s also written in our hearts and in the words we speak. This “unsettling force” is building and growing. 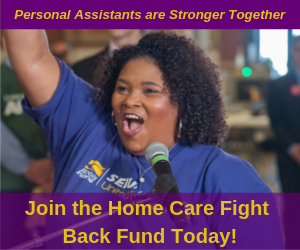 It means that hospital workers are organizing and building our power to fight the Illinois Hospital Association. It means that families and immigrant rights advocates are taking to the streets to fight human rights abuses happening right before our eyes. It means that we, as a community, are reclaiming our power and will speak the truth that we VALUE everyone who is struggling, living in poverty, or suffering. My friends, a storm is gathering…. And it is, without a doubt, unsettling!